It’s all about sugar! We have been told that eating too much sugar is bad for our health. Why oh why, do we like eating food containing this “naughty” substance? It tastes good that is why! Sugar is everywhere, lurking hidden in everyday food, tempting us to consume whatever it is in. It seems so hard to give it up. I know I’m addicted to sugar. If I buy a bag of lollies, I tend to eat them all in one morning. Once I start that block of chocolate it has to be shared or hidden so I don’t overeat. I especially love Whittaker’s dark chocolate, which we have been told is a “super food”, but contains 30% sugar. I’m craving some right now as I write this. Daughter Joanna has the book “Simplicious” which is full of sugar free recipes. It is written by Sarah Wilson, who is known for “I quit sugar”. Sarah uses “malted rice syrup” instead of sugar. I have purchased this, and tried it and it is very sweet, but I prefer maple syrup. After reading this book, I know I can’t and don’t want to give up sugar. It’s all about a bit of moderation for me now. I try and restrict my sugar intake during the week. It all goes along swimmingly until a work colleague offers me chocolate and then I’m in trouble again! My intention is there! I try to keep the real sweet things for the weekend, as treats. I can share my baking with my sweet-loving family. This seems to be a good balance for me. 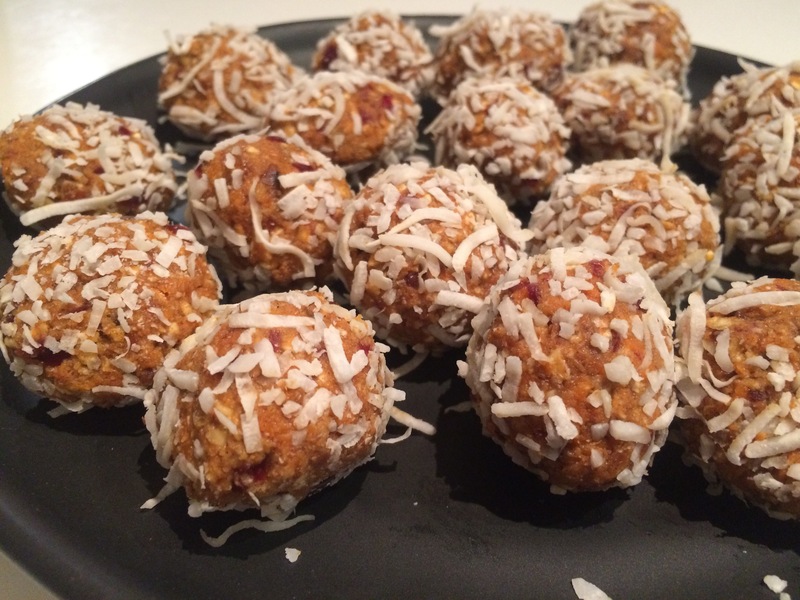 To help this balance along I have started making these bliss balls. What appealed to me the most about these delights is that carrots are a main ingredient. I love carrots, especially when they are in season. The recipe is modified from an orginal one from the Revive cafe. These little morsels are great for those times you need a little sweetness in your life, and you don’t want to eat the “naughty” sugar. They are great for the afternoon snack! I hope you like them. Roll in balls of desired size. I use a heaped teaspoon. Seal in a container and keep in the fridge until ready to eat. 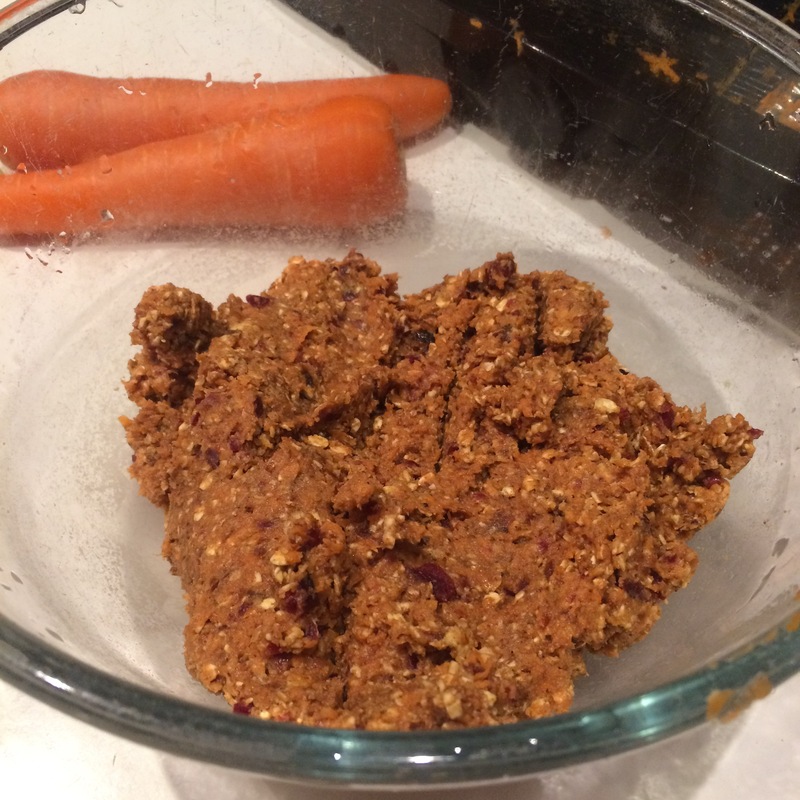 You can change the sultanas for cranberries or dried apricots. Also the spices can be changed according to your taste.